Tourists in central Moscow have a chance to rub shoulders and take selfies with living ghosts. 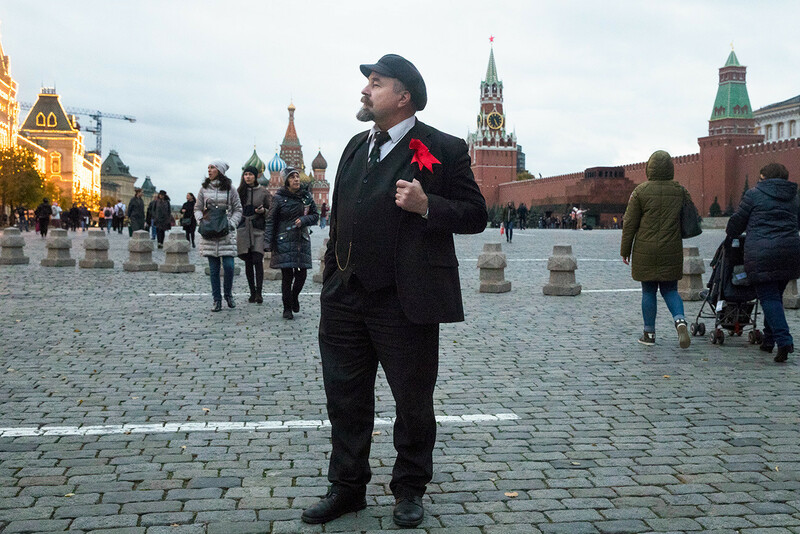 Coming out of the Lenin Mausoleum on Red Square, you might be forgiven for doing a double take—or several. Having seen the real Lenin lying peacefully in his glass case, you are likely to spy a few more living versions on the outside. You might also spot a couple of Uncle Joes here and there, not to mention Ivan the Terrible and Peter and Catherine the Greats. Don’t worry, they won’t send you to Siberia or chop your head off (we hope). They are just offering their lookalike services to photo-hungry tourists. Lenin and Stalin are probably the most popular doubles. They were the first to appear and have the privilege of working at the so-called "Kilometer Zero" near the Iberian Gate and Chapel just off Red Square (the point from which distances were traditionally measured). 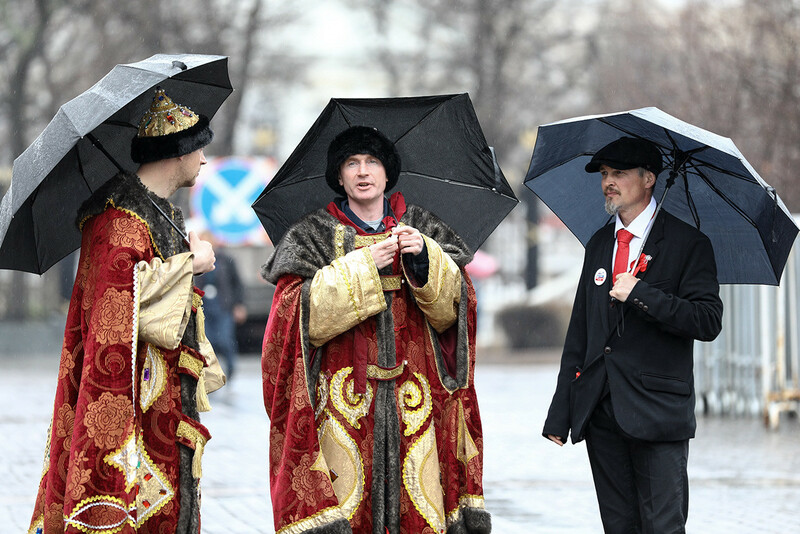 Meanwhile, the tsars and tsarinas wander around Manezh Square, near the monument to Georgy Zhukov and the Alexander Garden. 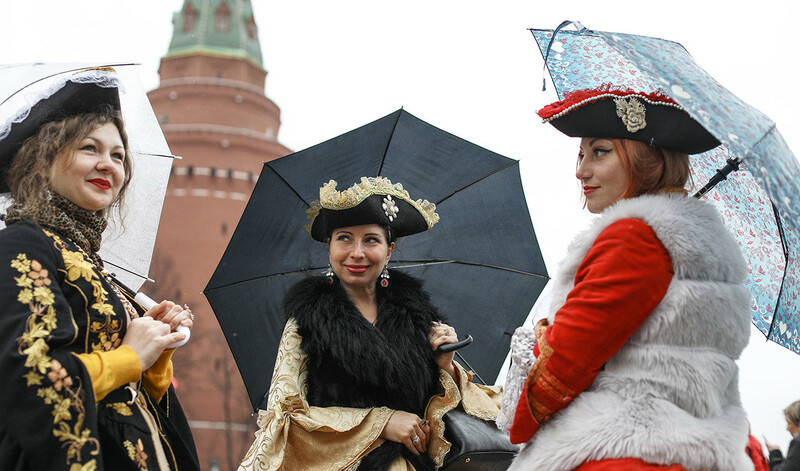 As the modern-day twin of Catherine the Great anonymously told Russia Beyond, the communists and tsars work separately, and even dislike each other, mirroring Russian history. However, this enmity has nothing to do with class prejudice, but stems from petty rivalry for tourist dollars. Stalin and Lenin themselves do not chase after tourists, but simply stand there waiting for people to approach. As the more popular doubles, they charge more than their tsarist predecessors (a photo with Catherine the Great or Ivan the Terrible costs 200 rubles ($3), while Stalin’s price tag starts at 300 rubles ($4.60), but tourists can haggle if they wish). 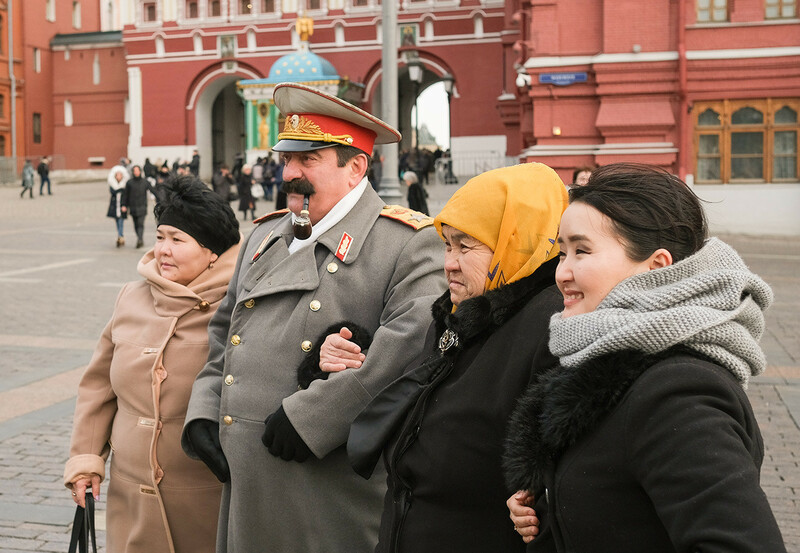 The tsars in their bright lush pseudo-historic attire do not rely on gifts of fate, but rather go after tourists themselves. During the 2018 FIFA World Cup, however, both groups were seen wandering around Nikolskaya Street, where most fans and tourists were congregated. In Soviet times, of course, such irreverence would have been unthinkable. 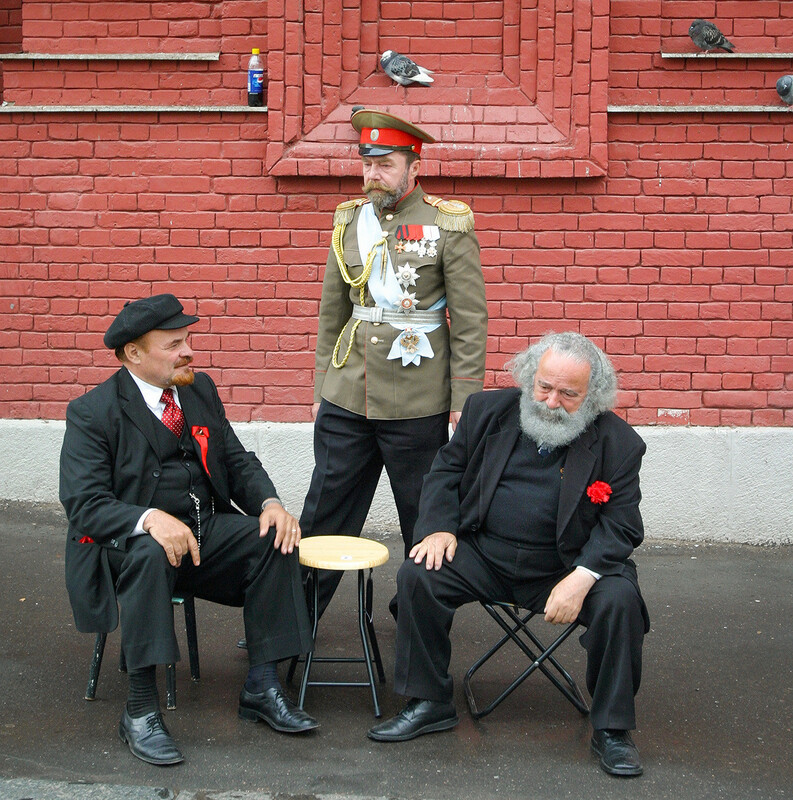 Even actors who played Lenin and Stalin in Soviet movies had to be approved by the higher-ups. Besides, private entrepreneurship was out of the question, so even the tsarist doppelgangers would have been banned from roaming Red Square in search of easy profit. When communism fell, Russian society split into two (non-gulag) camps: those wanting to reinstate communism and those yearning for capitalism. The unhealthy interest of both sides in the former communist idols (worshipped and cursed in equal measure), plus the opportunity to earn money from the new influx of tourists and the dire economic circumstances the country found itself in, prompted the first Lenin doubles to set foot on Manezh Square. 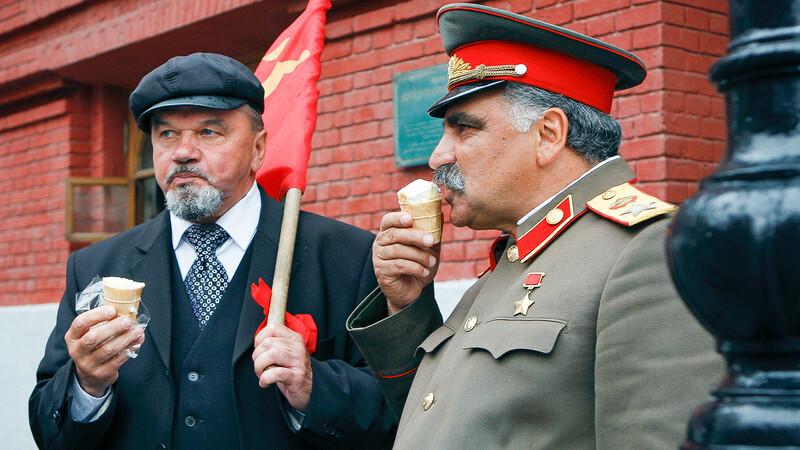 Gradually, as the tourist numbers and interest in the Soviet past climbed even more, Stalin, Marx, and other historical figures joined the Lenins. One of Stalin’s current doubles (real name Latif Valiyev) once worked as a truck driver. He has a strong Georgian accent, and copies the gestures and mannerisms of his hero to perfection. He has a hot temper too, not unlike the original moustachioed Kremlin incumbent. A few years ago, he got into a fight with his colleague Igor Gorbunov, a Lenin double, right there at the “workplace.” The disagreement of a professional nature: “Stalin” suspected “Lenin” of being in league with another “Stalin,” echoing the historical Uncle Joe’s paranoia. Thankfully, another blood-soaked civil war was averted when the two made up and agreed to continue working together. 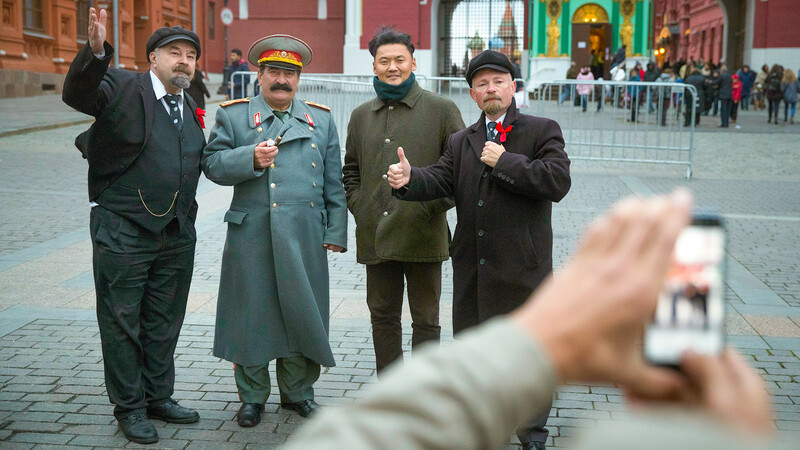 Besides them, central Moscow is home to a further five Stalins, eight Lenins, and “countless tsarinas and tsars,” actor Sergey Soloviev, one of the Lenins, told reporters. Sergey and his friend Arkady work at the “official” theater of doubles. They earn extra money in the city center in their spare time outside the theater, and even registered as sole traders for that purpose, paying tax on their earnings. As honest actors, they are ashamed of colleagues who blatantly extort money from tourists. Alexander Karlyshev, another actor who until recently also worked as a Lenin before health problems intervened, told the publication TOK that he arrived in Moscow from Tashkent in 1995 and spent hours standing in front of the Mausoleum, scaring foreign tourists who had only just seen the less animated Lenin inside. For a photo with him, Karlyshev charged whatever the “client” was willing to give. He is perhaps the only one of the Lenins who shares the convictions of the erstwhile leader of the world proletariat. Like the real Vladimir Ilych, he advocates social justice. He does not have his own apartment, living instead in a hostel, and a large portion of his earnings he gives away to orphanages and nursing homes.